[Spelt ALLAWAY on SDGW & CWGC] Private 123180, 24th Battalion, Machine Gun Corps (Infantry). Killed in action 21st March 1918 in France & Flanders. Aged 24. Born Croxley Green, enlisted Bedford. Husband of E. M. Allaway, of 38, Copeswood Rd., Watford. Formerly 21891, Yorkshire Regiment. No known grave. Commemorated on POZIERES MEMORIAL, Somme, France. Panel 90 to 93. Rifleman C/10, 16th Battalion, King's Royal Rifle Corps. Killed in action 2nd July 1916 in France & Flanders. Aged 20. Born Kingston-on-Thames, enlisted Watford, resident Croxley Green. Son of Samson and Harriet Arnold, of 251, New Rd., Croxley Green. Buried in CAMBRIN MILITARY CEMETERY, Pas de Calais, France. Row G. Grave 22. Private G/34030, 17th Battalion, Duke of Cambridge's Own (Middlesex Regiment). Killed in action 28th April 1917 in France & Flanders. Aged 28. Born Chenies, Buckinghamshire, enlisted Bedford, resident Croxley Green. Son of John and Jane Bastin, of Chenies, Rickmansworth; husband of Harriet Bastin, of Ridgehill, Winford, Bristol. No known grave. Commemorated on ARRAS MEMORIAL, Pas de Calais, France. Bay 7. Rifleman C/9152, "D" Company, 9th Battalion, King's Royal Rifle Corps. Died of wounds 27th March 1918 in France & Flanders. Aged 20. Born and resident Croxley Green, enlisted London. 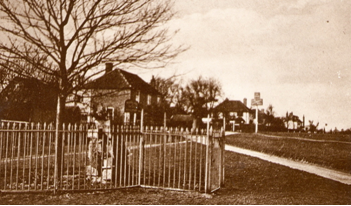 Son of William and Fanny Beament, of 123, New Rd., Croxley Green, Watford, Herts. Twice previously wounded. Commemorated on POZIERES MEMORIAL, Somme, France. Panel 61 to 64. Private G/41612, 1st Battalion, Duke of Cambridge's Own (Middlesex Regiment). Died 14th March 1917 in France & Flanders. Aged 24. Enlisted Bedford, resident Croxley Green. Son of Mrs. Emma Carter, of 46, Scots Hill, Croxley Green. Buried in HEILLY STATION CEMETERY, MERICOURT-L'ABBE, Somme, France. Plot VI. Row C. Grave 26. Private 43472, 2nd Battalion, Suffolk Regiment. Killed in action 28th March 1918 in France & Flanders. Born Croxley Green, enlisted Watford. Formerly 19727, Bedfordshire Regiment. Buried in CABARET-ROUGE BRITISH CEMETERY, SOUCHEZ, Pas de Calais, France. Plot XIV. Row F. Grave 12. Sergeant R/33836, 13th Battalion, King's Royal Rifle Corps. Died of wounds 4th November 1918 in France & Flanders. Born and resident Croxley Green, enlisted Hammersmith, Middlesex. Awarded the Military Medal (M.M.). Buried in ROMERIES COMMUNAL CEMETERY EXTENSION, Nord, France. Plot V. Row A. Grave 5. Private 12212, 7th Battalion, Norfolk Regiment. Killed in action 13th October 1915 in France & Flanders. Aged 20. Born Croxley Green, enlisted Watford. Son of Mr. and Mrs. J. Elbourne, of 34, Scots Hill. Croxley Green. No known grave. Commemorated on LOOS MEMORIAL, Pas de Calais, France. Panel 30 and 31. Private G/11285, 13th Battalion, Duke of Cambridge's Own 9Middlesex Regiment. Killed in action 18th August 1916 in France & Flanders. Born and resident Croxley Green, enlisted Watford. No known grave. Commemorated on THIEPVAL MEMORIAL, Somme, France. Pier and Face 12 D and 13 B. Private G/89489, 2nd Battalion, Duke of Cambridge's Own (Middlesex Regiment). Killed in action 24th April 1918 in France & Flanders. Born and resident Croxley Green, enlisted Watford. Buried in CRUCIFIX CORNER CEMETERY, VILLERS-BRETONNEUX, Somme, France. Plot IX. Row C. Grave 16. Private G/15551, "B" Company, 11th Battalion, Royal Sussex Regiment. Killed in action 3rd November 1916. Born Croxley Green, enlisted Hertford. Buried in BOISGUILLAUME COMMUNAL CEMETERY, Seine-Maritime, France. Plot II. Row B. Grave 8A. Lance Corporal 14161, 7th Battalion, Bedfordshire Regiment. Killed in action 16th November 1916. Aged 23. Born and resident Croxley, enlisted Watford. Son of the late Thomas and Martha Hobbs. No known grave. Commemorated on THIEPVAL MEMORIAL, Somme, France. [Listed as A J on memorial] Private B/203285, 13th Battalion, Rifle Brigade. Killed 14th November 1916. Born Watford, enlisted Watford, residence Watford. Son of James and Rose Lyons, 14 Dickinson's Square Croxley Green. Formerly R/301 (Soldiers Died in the Great War has C/301) Kings Royal Rifle Corps. No known grave. Commemorated on THIEPVAL MEMORIAL, Somme, France. Pier and Face 16 B and 16 C.
Gunner 6560, 140th Siege Battery, Royal Garrison Artillery. Died of wounds 14th May 1917 in the United Kingdom. Aged 25. Born Amersham, enlisted Watford, resident Croxley Green. Husband of Annie Mason, of 14, Scots Hill, Croxley Green. Buried in CHORLEYWOOD ROAD CEMETERY, Chorleywood, Hertfordshire. Plot D. Row 6. Grave 27. Rifleman (Lance Corporal) C/9420, 18th Battalion, King's Royal Rifle Corps. Died of wounds 23rd May 1918 in France & Flanders. Aged 20. Born Hertford, enlisted London, resident Croxley Green. Son of Mr. and Mrs. G. Mead, of 179, New Rd., Croxley Green. Buried in ESQUELBECQ MILITARY CEMETERY, Nord, France. Plot II. Row D. Grave 16. Private 23803, 6th Battalion, Princess Charlotte of Wales's (Royal Berkshire Regiment). Died of wounds 7th October 1916. Aged 31. Born and enlisted Watford. Son of the late William and Elizabeth Neale of Watford, husband of Mary Neale of 18 Sydney Road Watford, father to Maureen and Edmund Neale. Buried in ST SEVER CEMETERY ROUEN, Seine-Maritime, France. [Listed as OWEN on SDGW and CWGC] Lance Corporal 4944 [CWGC] or 4044 [SDGW], 16th Lancers (The Queen's). Killed in action 26th March 1918 in France & Flanders. Aged 23. Born Croxley Green, enlisted Mill Hill, resident Watford. Son of Thomas and Alice Owen, of 5, Cassio Bridge Terrace, Watford. No known grave. Commemorated on POZIERES MEMORIAL, Somme, France. Panel 5. Private TR10/170905, "B" Company, 53rd (Graduate) Battalion, Duke of Cambridge's Own (Middlesex Regiment). Died in the United Kingdom 24th October 1918. Aged 18. Enlisted Bedford, resident Croxley Green. Son of Arthur James Peek, of 196, New Rd., Croxley Green. Buried in CHORLEYWOOD ROAD CEMETERY, Chorleywood, Hertfordshire. Plot FF. Row 5. Grave 29. Private 12966, 8th Battalion, Bedfordshire Regiment. Killed in action 19th April 1916 in France & Flanders. Born Brighton, enlisted Watford, resident Croxley Green. No known grave. Commemorated on YPRES (MENIN GATE) MEMORIAL, Ieper, West-Vlaanderen, Belgium. Panel 31 and 33. Rifleman C/5, 16th Battalion, King's Royal Rifle Corps. Killed in action 15th July 1916 in France & Flanders. Aged 25. Born Croxley Green, enlisted Watford, resident Eastbourne, Sussex. From his army record his widow moved to Eastbourne after his death. His residence was therefore Croxley Green. He enlisted in September 1914 and married in July 1915. Son of William Rogers, of 7, Dickinson Square, Croxley Green; husband of Miriam Eliza Rogers, of "Glencairn," 6, Marine Rd., Eastbourne. Buried in CATERPILLAR VALLEY CEMETERY, LONGUEVAL, Somme, France. Plot XVI. Row K. Grave 14. Private T/254561, 904th Motor Transport Company, Royal Army Service Corps. Died at sea 15th April 1917. Born Loudwater, Buckinghamshire, enlisted Watford, resident Croxley Green. No known grave. Commemorated on MIKRA MEMORIAL, Greece. Second Lieutenant, 2nd Battalion, Alexandra, Princess of Waless Own (Yorkshire Regiment), originally 16th Lancers. Killed in action 1st July 1916. 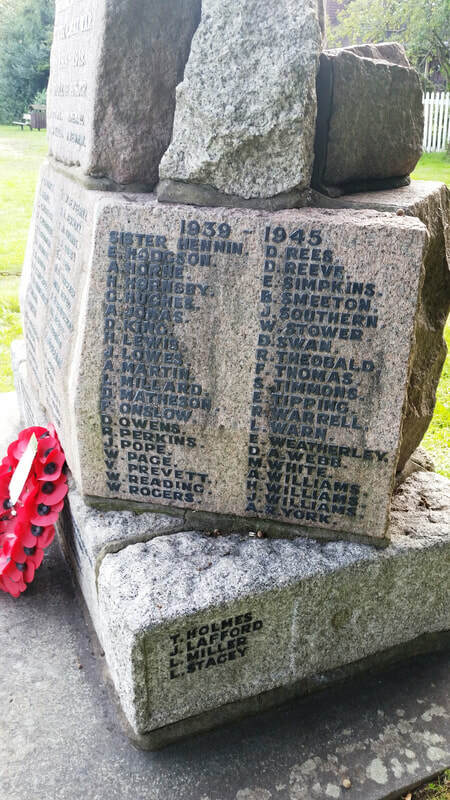 Ex Watford Grammar school pupil and included on their war memorial. Son of Mrs Strugnell and the late A C Strugnell of New Road Croxley Green. No known grave. Commemorated on THIEPVAL MEMORIAL, Somme, France. Pier and Face 3 A and 3 D.
Private 29631 [SDGW] or 29638 [CWGC], 2nd Battalion, Bedfordshire Regiment. Killed in action 21st March 1918 in France & Flanders. Aged 32. Born Dartford, Kent, enlisted Watford, resident Croxley Green. Husband of Frances Elizabeth Thomas, of "Coboro", Dickinson Avenue, Croxley Green. No known grave. Commemorated on POZIERES MEMORIAL, Somme, France. Panel 28 and 29. [CWGC reads as Corporal 1200] Lance Corporal 1300, 1st Battalion, Rifle Brigade 9The Prince Consort's Own). Killed in action 3rd November 1914 in France & Flanders. Aged 29. Born Watford, enlisted London, resident Croixley Green. Son of Edward and Sarah Toms, of 49, Dickinson Square, Croxley Green. Buried in LE TOUQUET RAILWAY CROSSING CEMETERY, Comines-Warneton, Hainaut, Belgium. Row C. Grave 7. Sapper 358237, 5th Field Survey Company, Royal Engineers. Died 3rd June 1918 in France & Flanders. Aged 20. Born Rickmansworth, enlisted Westminster, resident Croxley Green. Son of William Thomas and Lizzie Toms, of 26, York Rd., Croxley Green. Formerly 2820, Royal Fusiliers. Buried in ANNOIS COMMUNAL CEMETERY, Aisne, France. Plot I. Row B. Grave 6. Rifleman (Lance Corporal) C/1016, 16th Battalion, King's Royal Rifle Corps. Died of wounds 22nd July 1916 in France & Flanders. Aged 28. Born and resident Croxley Green, enlisted Watford. Son of Mr. and Mrs. Thomas Warn, of 222, New Rd., Croxley Green. Buried in HEILLY STATION CEMETERY, MERICOURT-L'ABBE, Somme, France. Plot II. Row C. Grave 22. Private G/29550, 17th Battalion, Duke of Cambridge's Own (Middlesex Regiment). Died in the United Kingdom 11th May 1918. Aged 31. Born Stroud, Gloucesershire, enlisted Bedford, resident Croxley Green. Son of Joseph Webb; husband of Fanny Elizabeth Webb, of 267, New Rd., Croxley Green. Buried in CHORLEYWOOD ROAD CEMETERY, Chorleywood, Hertfordshire. Plot EE. Row 4. Grave 11. Lance Corporal 16097, 4th Battalion, Bedfordshire Regiment. Killed in action 30th September 1918 in France & Flanders. Born and resident Croxley Green, enlisted Marylebone, Middlesex. No known grave. Commemorated on VIS-EN-ARTOIS MEMORIAL, Pas de Calais, France. Panel 4 and 5. Rifleman 322074, 6th (City of London) Battalion (Rifles), London Regiment. Died of wounds 13th March 1917 in France & Flanders. Aged 22. Born and resident Croxley Green, enlisted London. 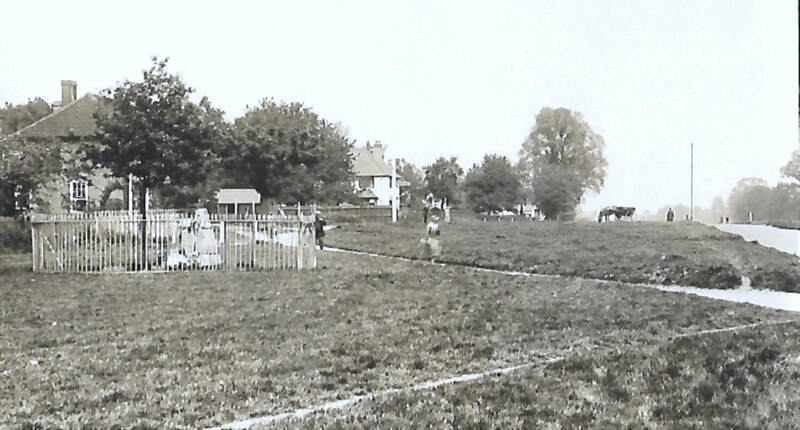 Son of Joseph and Mary Rose Woollams, of 231, New Rd., Croxley Green. Buried in LIJSSENTHOEK MILITARY CEMETERY, Poperinge, West-Vlaanderen, Belgium. Plot XI. Row B. Grave 37. Private 11259113, 4th Battalion, King's Own Scottish Borderers. Died 24th January 1945. Aged 34. Son of William and Annie Edith Allaway; husband of Hilda Allaway, of Croxley Green. Buried in SITTARD WAR CEMETERY, Limbard, Netherlands. Row C Grave 16. Corporal 7951967, A Squadron, North irish Horse, Royal Armoured Corps. Died 18th September 1944. Aged 22. Son of Ernest William and Edith Asprey, of Croxley Green. Buried in GRADARA WAR CEMETERY, Italy. Plot II. Row A. Grave 22. Lance Corporal 5951963, 5th Battalion, Bedfordshire and Hertfordshire Regiment. Died 19th September 1943 as a P.O.W. of the Japanese. Aged 26. 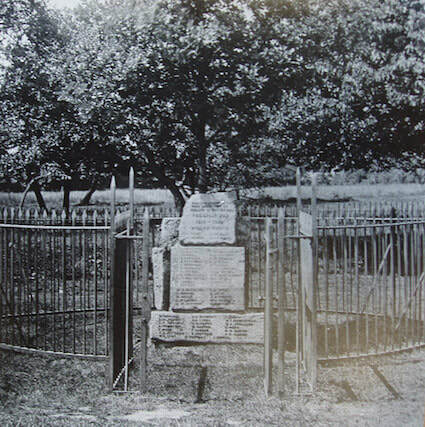 Buried in CHUNGKAI WAR CEMETERY, Thailand. Plot 1. Row O. Grave 3. Private 5777670, 6th Battalion, Royal Norfolk Regiment. Died 26th January 1942 during the Japanese invasion of Singapore. Aged 26. Son of Horace and Hilda Beament, of Croxley Green, Hertfordshire; husband of Mary Beament, of Birr, Offaly, Irish Republic. 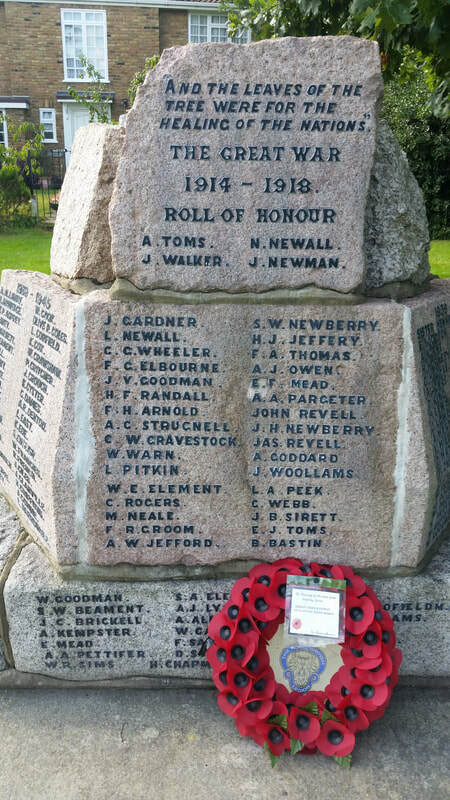 Nephew of S W Beament who is listed on the 1914-18 memorial. No known grave. Commemorated on the SINGAPORE MEMORIAL, Kranji War Cemetery, Singapore. Coluimn 49. Gunner 1531846, 104 H.A.A. Regiment, Royal Artillery. Died 26th December 1943. Aged 25. Son of Sidney and Winifred Nellie Beavis, of Croxley Green. Buried in CATANIA WAR CEMETERY, SICILY, Italy. Plot II. Row E. Grave 12. Leading Aircraftwoman (LACW) 2030586, Women's Auxiliary Air Force. Contracted Tuberculosis (TB) through poor living conditions and lack of proper medical care at RAF Skellingthorpe and RAF Stargate, Lincolnshire (Bomber Command). She was Motor Transport Driver on aircrew buses etc. Died on active service 17th March 1946. Age 27. Daughter of Henry Arthur and Edith Nellie Coles, of Croxley Green, Rickmansworth. Buried with her mother and father in CHORLEYWOOD ROAD CEMETERY, Hertfordshire. Sec. B. Row 4. Grave 9. Sapper 161287, Royal Engineers. Died 4th July 1941. Aged 25. Son of Harold and Kate Condliffe; husband of Beryl Christina Condliffe, of Croxley Green, Hertfordshire. Buried in TEL EL KEBIR WAR MEMORIAL CEMETERY, Egypt. Plot 3. Row O. grave 11.
probably John COOLEY. Aircraftman 2nd Calss, Royal Air Force Volunteer Reserve. Died 16th January 1942. Aged 29. Son of Albert Charles and Ethel Cooley; husband of Eileen Cooley, of Rickmansworth, Hertfordshire. No known grave. Commemorated on RUNNYMEDE MEMORIAL, Surrey. Panel 98. Flight Sergeant (Navigator) 928686, 117 Squadron, Royal Air Force Volunteer Reserve. Died 5th february 1943. Aged 22. Son of Jack and Ethel Mary Corfield, of Croxley Green, Hertfordshire. Buried in TOBRUK WAR CEMETERY, Libya. Plot 10. Row C. Grave 14. Air Mechanic (E) 2nd Class FX.108085, H.M.S. Ukussa, Royal Navy. Died 19th July 1944. Aged 19. Son of Winifred Cox, and stepson of William Saunders, of Croxley Green, Hertfordshire. Buried in COLOMBO (LIVERAMENTU) CEMETERY, Sri Lanka. Plot 2.Row G. Grave 14.
probably William CRAWSHAW, Private 2650333, 4 Base Ordnance Depot, Royal Army ordnance Corps. Died 28th May 1942. Aged 37. Son of James and Anna Crawshaw; husband of Emiline Annie Crawshaw, of Slough, Buckinghamshire. No known grave. Commemorated on ALAMEIN MEMORIAL, Egypt. Column 84. Ordinary Seaman P/JX 337873, H.M.S. twwed, Royal Navy. Died 7th January 1944. Aged 20. Son of Arthur and Minnie Hill Critcher, of Croxley Green, Hertfordshire. No known grave. Commemorated on PORTSMOUTH NAVAL MEMORIAL, Hampshire. Panel 83, Column 3. Sergeant (Air Gunner) 1437428, 460 (R.A.A.F.) Squadron, Royal Air Force Volunteer Reserve. Died 9th April 1944. Aged 20. Son of William Vincent and Frances Grace Mary Crouch, of Croxley Green Hertfordshire. Buried in CAMBRIDGE CITY CEMETERY, Cambridge. Grave 13960. Leading Aircraftman 751792, Royal Air Force Volunteer Reserve. Died on active service at Chesil Bank, Weymouth, 22nd April 1940. Aged 21. Born 2nd April 1919. Stationed at RAF Warmwell, Dorset. Son of Frederick and Dora Lilian Cyster, 12 Dickinson Avenue, Croxley Green Herts. Husband of Sylvia (married 20th April 1940). 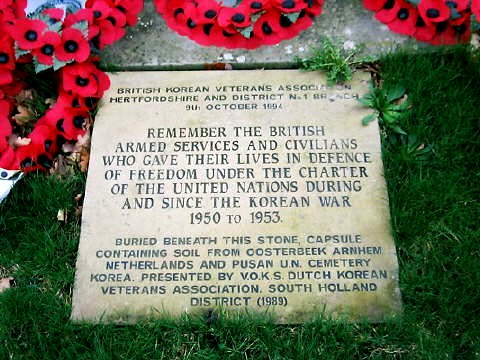 Commemorated on a memorial tablet in St Luke’s Church, Watford. Buried in the family grave, Rickmansworth, R4 no 19. Commemorated on RUNNYMEDE MEMORIAL, Surrey. Panel 22. Lance Bombardier 935341, 56 Heavy Regiment, Royal Artillery. Died 10th April 1943. Aged 31. Son of T. and Rose Denton, of Croxley Green, Hertfordshire. Buried in MEDJEZ-EL-BAB WAR CEMETERY, Tunisia. Plot 4. Row H. Grave 8. Able Seaman C/JX 311930, S.S. Cape Corso, Royal Navy. Died 2nd May 1942. Aged 19. Son of William J. and Diana Eliza East, of Croxley Green. Hertfordshire. No known grave. Commemorated on CHATHAM NAVAL MEMORIAL, Kent. Panel 53, Column 3. Sergeant 5950833, Bedfordshire and Hertfordshire Regiment. Died 10th June 1944. Aged 26. Born Norfolk, resident Hertfordshire. Son of Thomas William and Hilda Mary Francies, of Croxley Green, Hertfordshire. Buried in NAKURU NORTH CEMETERY, Kenya. Grave 494. Leading Aircraftman 1257946, Royal Air Force Volunteer Reserve. Died 19th April 1941. Aged 20. Son of Joseph and Helena Giles, of Croxley Green Hertfordshire. Buried in BRANDON CEMETERY, Manitoba, canada. Lot 113. Block A. Section 27. Private 5437587, 2nd Battalion, Duke of Cornwall's Light Infantry. Died 21st May 1940. Aged 20. Son of Frank and Mary Elizabeth Glanville, of Croxley Green, Hertfordshire. Buried in AVELGEM COMMUNAL CEMETERY, Avelgem, West-Vlaanderen, Belgium. Row D. Grave 3. Sister 208504, 54 General Hospital, Queen Alexandra's Imperial Military Nursing Service. Died 28th January 1945. Aged 42. Daughter of William Joseph and Kathrine Ellen Hennin. Buried in CORIANO RIDGE WAR CEMETERY, Italy. Plot XV. Row G. Grave 4. Lance Corporal 4981056, 14th Battalion, Sherwood Foresters (Nottinghamshire and Derbyshire Regiment). Died 27th May 1944. Son of Mr. and Mrs. Joseph Horne; husband of Mary Horne, of Croxley Green, Hertfordshire. Buried in BEACH HEAD WAR CEMETERY, ANZIO, Italy. Plot XV. Row D. Grave 1. Petty Officer D/J 109047, H.M.S. Bonaventure, Royal Navy. Killed in action when HMS Bonaventure was by being torpedoed and sunk on 31st March 1941 in Hong Kong harbour. Aged 33. Son of Albert Victor and Mary Millard; husband of Dorothy L. Millard, of Rickmansworth, Hertfordshire. No known grave. 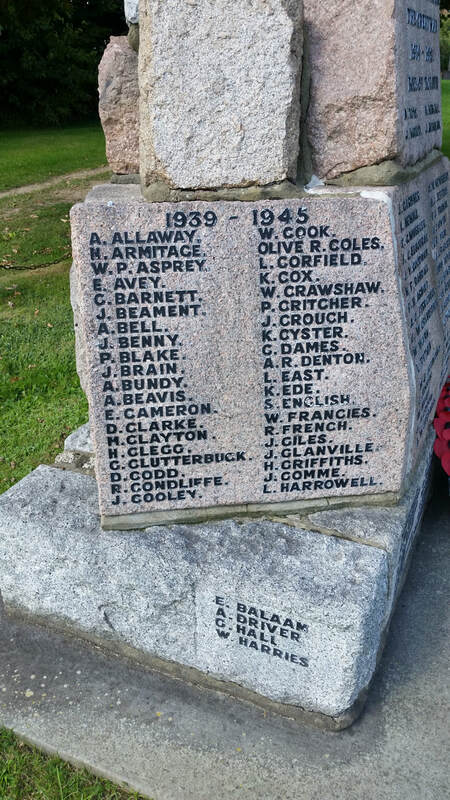 Commemorated on PLYMOUTH NAVAL MEMORIAL, Devon. Panel 45, Column 3. Private 5833628, 4th Battalion, Suffolk Regiment. Died as a prisoner of war while working on the Burma-Siam Railway 8th October 1943. Aged 31. Son of James and Alice Pope; husband of Eveline (Eve) Florence Pope, of Croxley Green, Hertfordshire. Buried in KANCHANABURI WAR CEMETERY, Thailand. Plot 8. Row B. Grave 9.